Scientists at the University of Queensland in Australia have reported that certain reef fish use ultraviolet (UV) vision to identify whether another fish is of their own or another similar species. 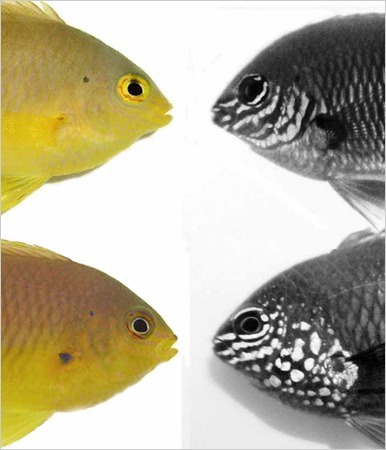 A paper published in the latest issue of Current Biology, reveals that Ambon damselfish may be able to recognize another fish in much the same way humans do…. by their face. Speculation that UV vision may be in play here, are due to the fact that unique UV markings on each fish’s face would be invisible to their predators. In a series of cleverly designed experiments, male Ambon damselfish were exposed to other males of the same species, as well as males of different species with similar body coloration but different UV facial patterns. The experiments were performed under conditions where the UV markings visible, then repeated under conditions where the UV markings could not be seen. The team found that the Ambon damselfish only demonstrated territorial behavior in the cases when the UV patterns could be seen, suggesting that these are used by the damselfish to distinguish between their own species, to another. Further experiments showed that the fish actually recognized the pattern of the markings, not just their color.